NON-SLIP SNOW GRABBERS | Heavy-duty | SNOW GRABBERS Series | Jia Hao Plastics Factory CO.,LTD. Excellent traction with special non-slip studs can reduce the risk while walking on slick surfaces. 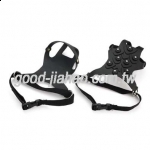 With adjustable straps to fit with different sizes of shoes. 1. There are three holes can adjust three sizes. 2. The length of nylon tape is 75cm, you could cut to meet suitable length. 3. It has distinguishability between right and left. 4. The material is flexible to -40c. 5. The special non-slip studs provide excellent traction on ice and snow.